The smartphons now a days are so feature packed but these devices cannot be said as battery packed. The biggest complaint about these devices is the battery life. The displays are getting bigger and bigger, the processors are getting much faster but there is not enough juice to power it up. Theres a slight improvement in batteries (except some) as compared to other technology. 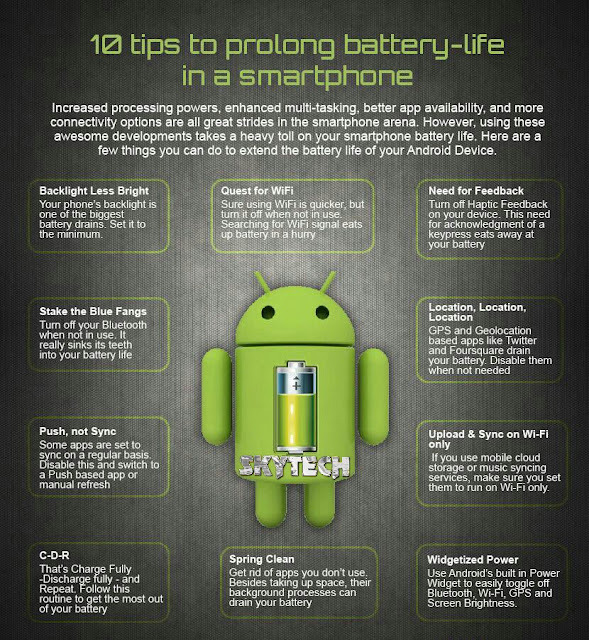 To improve your Android, iOS, Windows running device battery life just follow our 10 useful battery saving tips and feel the difference. Brightness :- Your phone’s or tablet’s display is the most battery consumer. Set the brightness to “Auto” and shorter time outs. Also some phone has a backlight option also set it to minimum. Bluetooth :- Trun off Bluetooth when not in use. And also turn off the Bluetooth headset if you have one. Sync off :- Trun off the Auto sync. Some apps use the data connection regularly the consumes ram and battery both. Perform a refresh manually. Upload and sync :- If your are a cloud service user for music, storage syncing and other services than make sure they are set to Wi-Fi only. This will reduce time consumption and also your precious 2/3/4G data connection.